These Beaded Bracelets are perfect for the little ones or as friendship bracelets. They are perfect for boys or girls. The beaded area is approximately 4-1/2 inches long with ties to tie on the wrist. 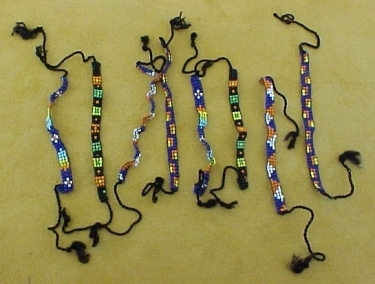 They have brightly colored beads in several patterns and are three beads in width. Patterns are assorted. You may request a specific pattern and we will do our best to but we reserve the right to ship a different pattern.